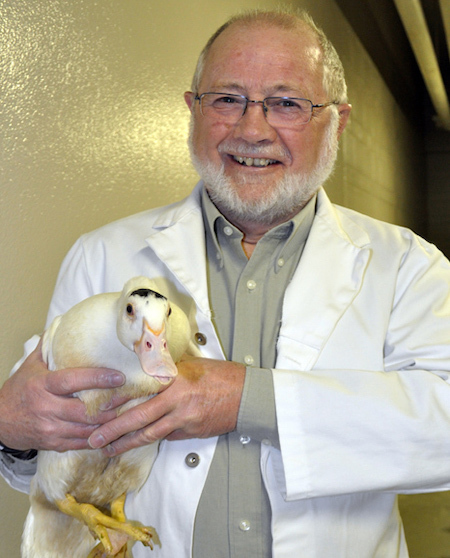 Dubbed the “chicken whisperer,” University of Guelph animal biosciences professor emeritus Ian Duncan has been named the recipient of the 2019 Frederic A. McGrand Lifetime Achievement Award from Humane Canada. Humane Canada brings together SPCAs and humane societies from across the country. The award “acknowledges outstanding contributions to animal welfare in Canada,” said Barbara Cartwright, CEO of Humane Canada, based in Nepean, Ont. A member of the former Department of Animal and Poultry Science for 21 years, Duncan was among the first researchers to develop a scientific approach to solving animal welfare problems. His work based on “asking” animals what matters to them has led to the development of similar techniques for other species. Considered a top expert in farm animal welfare, especially poultry welfare, he has worked with organizations worldwide to develop animal welfare certification programs. He will receive the award this weekend during Humane Canada’s sixth annual National Animal Welfare Conference in Montreal. In 2017, Duncan received the organization’s Leadership in Farm Animal Welfare Award for his work on the National Farm Animal Care Council’s code committee for layer hens.